The Northwest is brimming with talented, dedicated people who can deliver quantum computing advances today and secure our quantum future for tomorrow. Today, at the inaugural Northwest Quantum Nexus Summit, we announced the Northwest Quantum Nexus, a coalition assembled by three keystone partners: Microsoft Quantum, the Pacific Northwest National Laboratory, and the University of Washington. In line with the goals of the National Quantum Initiative Act, the Northwest Quantum Nexus accelerates Quantum Information Science (QIS) to develop a quantum economy and workforce in the greater Pacific Northwest region of the United States and Canada. The high concentration of quantum activity in the Northwest makes it one of the top regions globally to address key QIS needs. The goal of the two-day Summit this week is to bring together the region’s experts who can define the region’s potential to drive quantum computing’s future. Applying research outcomes to application areas and testbeds, including clean energy and sustainability. The Northwest Quantum Nexus intersects with another complementary, broad-based initiative led by Microsoft, the Microsoft Quantum Network. Both the Northwest Quantum Nexus and the Microsoft Quantum Network were begun with the understanding that creating a scalable quantum computer will require the collective effort of many skilled and diverse teams. Just last week, Microsoft hosted the Microsoft Quantum Network’s first Startup Summit. The Northwest Quantum Nexus partnership unites considerable intellectual talent. The University of Washington is one of the top research institutions in the world. It recently established UW Quantum X, which joins existing research endeavors across the university in QIS, including quantum sensing, quantum computing, quantum communication, and quantum materials. Recently, in a partnership of Microsoft Quantum researchers and the University of Washington faculty, we identified opportunities to ready students with quantum computing programming skills and an understanding of quantum algorithms. Microsoft researchers now teach quantum computing programming and algorithm development with the Q# programming language, giving students a head start in developing quantum solutions. Pacific Northwest National Laboratory’s (PNNL) QIS program includes capabilities in algorithm development and programming, as well as expertise in materials synthesis and characterization, quantum chemistry applications, quantum sensing, and workforce development – all fields are seeing tremendous advances today due to the power of a quantum computer. Microsoft has recently collaborated with PNNL on the Microsoft Quantum Development Kit chemistry library. The library can be used in conjunction with NWChem, an open-source, high-performance computational chemistry tool funded by the U.S. Department of Energy’s Office of Science. 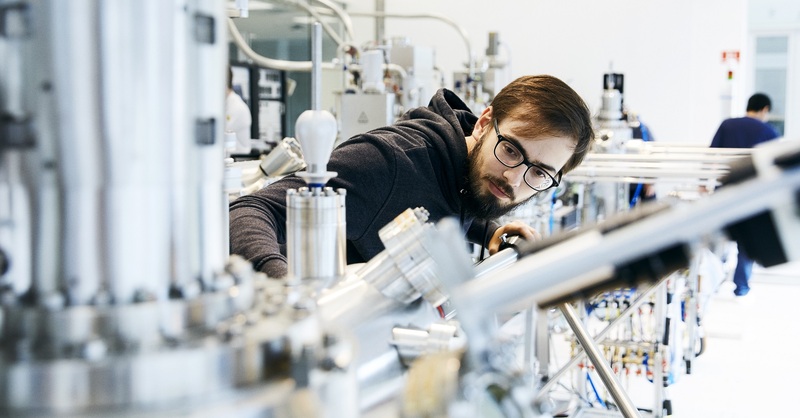 With the state-of-the-art tools provided in the Quantum Development Kit – including resource estimation, algorithm programming, debugging and simulation – this collaboration enables chemists to develop quantum chemistry solutions for a quantum computer, and better understand what that solution can look like today. As for Microsoft, we’ve been driving advances in quantum computing and software development for 15 years. We see the power of quantum computing as solving some of the world’s most challenging problems for a wide range of industries – healthcare, environmental sciences, financial services, auto engineering, and others. Our team of experts in quantum physics, mathematics, computer science, and engineering have partnered with universities, industry, and government on cross-cutting research to advance our scalable qubit approach across the globe. The prominence of the Northwest Quantum Nexus is expected to increase the visibility of QIS research, leading to even greater collaboration and drawing quantum talent – trainees and employers – to the U.S. Locally, the Northwest Quantum Nexus will help position the greater Pacific Northwest region as a global leader for creating and sustaining an exceptional quantum workforce and economy. Visit the Northwest Quantum Nexus web site to learn more about this important coalition. Creating a scalable quantum computer will require the collective effort of many skilled and diverse teams. To reach that goal, over the past few years we have built a coalition of partners, universities, customers, and developers, all with the goal of sharing knowledge and collaborating with the best quantum innovators. Today – at our inaugural Startup Summit – we’re formalizing that coalition as the Microsoft Quantum Network. This global community of individuals and organizations will work directly with Microsoft to advance quantum computing, develop practical applications, and build the quantum workforce of the future. “The Microsoft Quantum Network is our commitment to establishing the partnerships required to build the quantum workforce and the quantum economy,” Todd Holmdahl, Corporate Vice President of Azure Hardware Systems Group at Microsoft, said during the summit. “We believe both are vital to solving some of the world’s toughest problems. HQS Quantum Simulations develops quantum algorithms for predicting molecular properties for the chemical and pharmaceutical industries. Rahko is a quantum machine–learning company developing scalable quantum chemistry solutions for near-term quantum computers and beyond. HQS Quantum Simulations and Rahko will join other quantum startups who are working closely with Microsoft to build practical applications and accelerate the adoption of quantum computing. Quantum Network startups also benefit from a partnership with Microsoft for Startups to help them grow their businesses, build innovative solutions, and connect to valuable resources. Affiliate organizations have engaged directly with Microsoft to advance their expertise in quantum computing and jointly develop solutions that benefit their organization and industry. Case Western Reserve University (CWRU), the Dubai Electricity and Water Authority (DEWA), and Pacific Northwest National Labs (PNNL) are examples of organizations collaborating with us on many solutions in the areas of optimization and chemistry. Centers dedicated to research, development, and educational excellence have partnered with Microsoft to pursue the advancement of quantum computing. Today we’re performing quantum research alongside some of the best and brightest minds at Purdue University, UC Santa Barbara, the University of Copenhagen, TU Delft, and the University of Sydney. 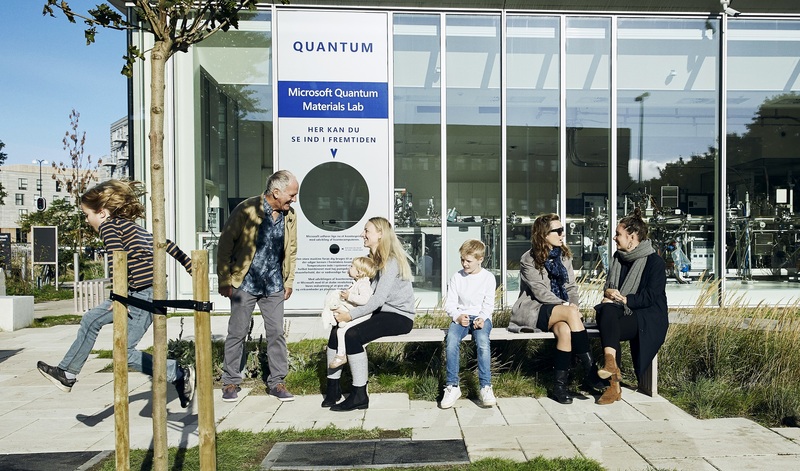 At these locations, we’ve established Microsoft Quantum Labs where our research teams are advancing Microsoft Quantum research goals while also serving as scientific collaborators and partners with the quantum community. Developers and organizations have created their own quantum algorithms and applications with our free resources, including the Microsoft Quantum Development Kit, tutorials, Q# libraries, samples, and workshops. Developers have now downloaded the Quantum Development Kit more than 100,000 times. If you or your organization are interested in becoming a member of the Microsoft Quantum Network as a startup or affiliate, click here to tell us about yourself. It will take a diverse set of skills across academia and industry to help develop the world’s first scalable quantum computer and quantum applications. We are excited to bring together the best minds in quantum computing. Together, we will bring this vision to life and shape the future of the quantum workforce and economy. New quantum chemistry library. The new quantum chemistry library can be used to develop quantum simulation solutions in the chemistry domain. Improved Q# developer experience. The Quantum Development Kit now delivers deeper integration with Visual Studio and Visual Studio Code. This update includes live feedback as you type, with errors indicated by underlined errors and warnings. New Q# language capabilities. The Q# programming language has been extended in ways that unify how developers code common operations, such as iteration over arrays, making coding in Q# easier and faster. Quantum computers have the potential to solve the world’s hardest computational problems and forever alter our economic, industrial, academic, and societal landscape. One significant area is computational chemistry, where quantum computers will drive advancements in areas such as drug discovery, development of pigments and dyes, and the development of catalysts for industrial processes. These processes could break down pollutants in exhaust streams, extract atmospheric nitrogen to make fertilizer, and enable new methods for carbon capture. For example, a quantum computer may help identify a way to remove carbon from our environment more efficiently, to combat global warming. State-of-the-art Q# implementations of methods for Hamiltonian simulation. Various samples to help the user get started quickly. Integrations with NWChem, an open source high-performance computational chemistry software package. The chemistry library was developed in collaboration with Pacific Northwest National Laboratory (PNNL), a leader in both chemistry and data analytics. Together, the chemistry library and NWChem enable quantum solutions and allow researchers and developers a higher-level of study and discovery as they tackle today’s computationally complex chemistry problems. Learn more about the new chemistry library here. The updated Quantum Development Kit offers enhanced integration with both Visual Studio and Visual Studio Code. This includes IntelliSense features such as real-time feedback on errors. 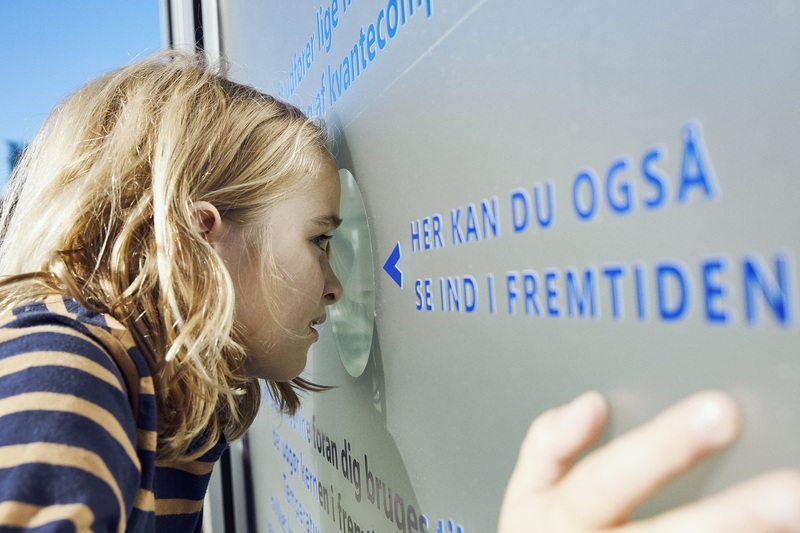 Additionally, the Q# language continues to improve and now provides more powerful language expressions that simplify the task of quantum programming. For instance, to simplify common code patterns, we added a conditional operator (condition? true | false) and iteration over arrays as well as ranges. Learn more about the new Q# language changes here. Update to Quantum Development Kit 0.3 Today! With the updated kit you’ll find a suite of detailed documentation, tutorials, libraries, and sample algorithms and Q# code. You can dive right in with the included quantum codes and find easy-to-follow samples crafted in Q# for highly optimized and intuitively written code. The Quantum Development Kit supports a broad and inclusive range of development platforms, including Windows, Linux, and macOS. It also supports programming languages such as Python on Windows. The kit also includes simulation tools that can mimic execution on a quantum computer and allows users to optimize their code and estimate the resource cost of running a solution on a real quantum computer with the help of the included Trace Simulator. To start learning how to program for quantum, try our self-paced tutorials called the Microsoft Quantum Katas. These coding katas are great tools for learning a new programming language and rely on several simple learning principles: active learning, incremental complexity growth, and feedback. Today, developers around the world are exploring the Microsoft Quantum Development Kit and experiencing the world of quantum computing, from startups to the enterprise and across academia, research, and design. The scalable Microsoft quantum computing solution is already enabling problem-solvers from various disciplines and skill levels to explore the world of quantum development and begin solving some of the planet’s most complex challenges. With our updated Quantum Development Kit, we’re excited to help our growing community take another step toward the new world of quantum computing. This post was authored with contributions by Cathy Palmer, Program Manager, Quantum Software & Services. Today, Microsoft released an update to the Microsoft Quantum Development Kit including an enhanced debugging experience and faster simulations, as well as several contributions from the Q# community. We’re excited about the momentum generated by the many new Q# developers joining us in building a new generation of quantum computing. 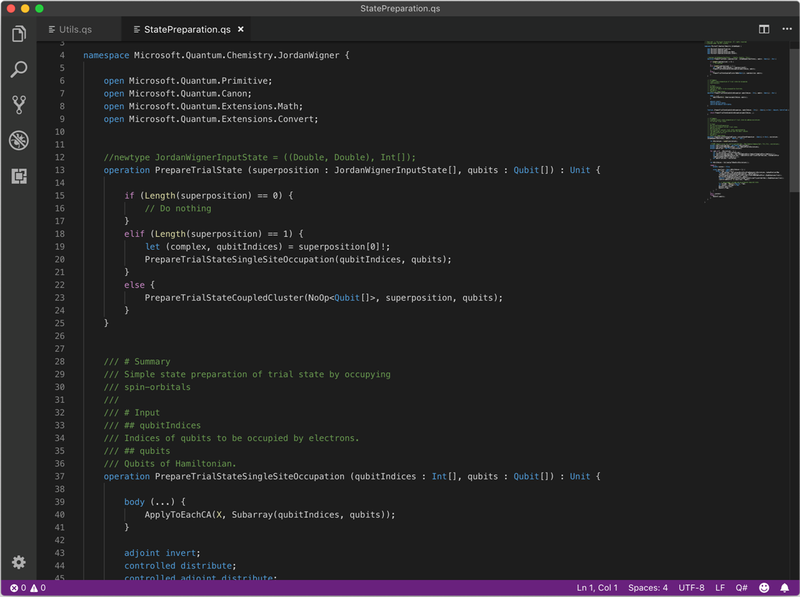 Just over six months ago, we released a preview of Q#, our new programming language for quantum development featuring rich integration with Visual Studio. The February 26 release added integration with Visual Studio Code to support Q# development on macOS and Linux as well as Python interoperability for Windows. Since then, tens of thousands of developers have begun to explore Q# and the world of quantum development. Today’s update includes significant performance improvements for simulations, regardless of the number of qubits required, as shown in the H2 simulation below. This is a standard sample included in the Microsoft Quantum Development Kit. 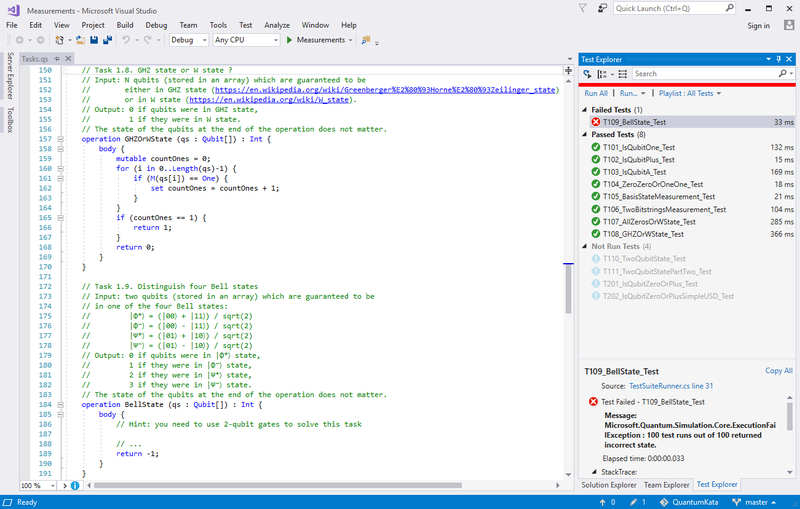 This update includes new debugging functionality within Visual Studio. The probability of measuring a “1” on a qubit is now automatically shown in the Visual Studio debugging window, making it easier to check the accuracy of your code. The release also improves the display of variable properties, enhancing the readability of the quantum state. Adding to the new debugging improvements, you’ll find two new functions that output probability information related to the target quantum machine at a specified point in time, called DumpMachine and DumpRegister. To learn more, you can review this additional information on debugging quantum programs. Thanks to your community contributions, the Microsoft Quantum Development Kit now includes new helper functions and operations, plus new samples to improve the onboarding and debugging experience. Check out the release notes for a full list of contributions. We’ve been thrilled with the participation, contributions, and inspiring work of the Q# community. We can’t wait to see what you do next. Microsoft is “all-in” on building a quantum computer and is making advancements “every day”, according to one of the company’s top experts on the technology. Julie Love (above), Director of Quantum Computing, called the firm’s push to build the next generation of computer technology “one of the biggest disruptive bets we have made as a company”. Quantum computing has the potential to help humans tackle some of the world’s biggest problems in areas such as materials science, chemistry, genetics, medicine and the environment. It uses the physics of qubits to create a way of computing that can work on specific kinds of problems that are impossible with today’s computers. In theory, a problem that would take today’s machines billions of years to solve could be completed by a quantum computer in minutes, hours or days. While Microsoft has noted that no one has yet built a working quantum computer, Love said the company has the right team in place to make progress and eventually create a system and software that can tackle real-world issues. Over the past decade, Microsoft has built a team comprised of some of the greatest minds in quantum physics, mathematics, computer science and engineering. It is also working with some of the leading experts in universities across the world. “Quantum computers could solve a set of problems that are completely intractable to humans at this time, and it could do so in 100 seconds,” she said during a speech at London Tech Week. “Microsoft’s enterprise customers are interested in changing their businesses using this technology, and we have set our sights beyond the hype cycle. We have a good understanding of what’s needed. Microsoft is the only major company attempting to build topological qubits, which aims to significantly reduce any interference at a subatomic level that might affect the machine. With this approach, the computational qubits will be “corrected” by the other qubits. “When we run systems, there are trade-offs in power, because they have to be very cold. However, we get higher compute capabilities,” said Love, who started studying quantum computing in the late-1990s. Last year, Microsoft released a Quantum Development Kit, which includes its Q# programming language for people who want to start writing applications for a quantum computer. These can be tested in Microsoft’s online simulator. Q# is designed for developers who are keen to learn how to program on these machines whether or not they are experts in the field of quantum physics. “We have released the Quantum Development Kit so developers can learn to program a quantum computer and join us on this journey,” Love added.